The OpenCart system defines 4 positions to put your modules – Content Top, Content Bottom, Column Right and Column Left. Page Builder Areas are placeholders for dynamically generated content from the Page Builder tool similar to OpenCart positions. 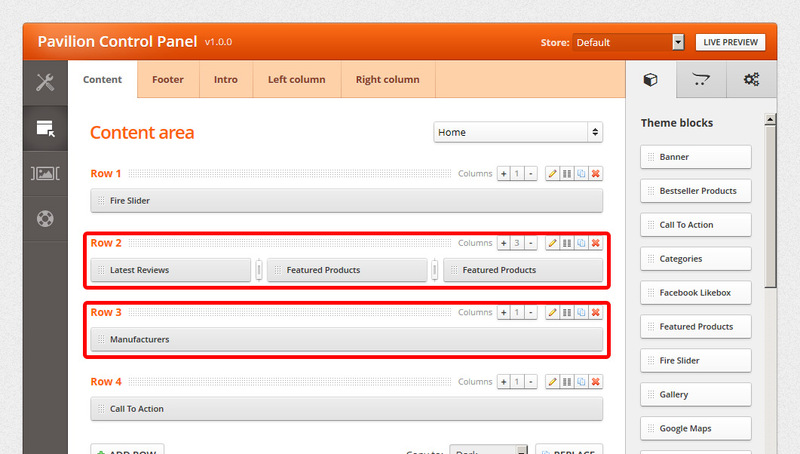 There are 5 areas in Pavilion where you can place custom blocks – intro, content, left column, right column and footer. Each Page Builder Area is organized into rows and columns (do not confuse the row columns with the sidebars of the site), where you can insert content blocks. Before you assign content (rows and blocks) to a given area, you must decide where to display it. The combo box (scopes dropdown) in the upper right corner of each area in the page builder contains all of the possible pages you can attach content to. A single rows and blocks configuration can be shown on multiple pages – it depends on the scope (combo box option) you choose. The scopes represent easy and powerful inheritance rules which can save you time when building content. Rows are used to divide your page into logical regions. Each row can have up to 6 columns. Columns are centered inside the row and span up to the maximum website width. They are invisible elements and are only used to store content blocks. 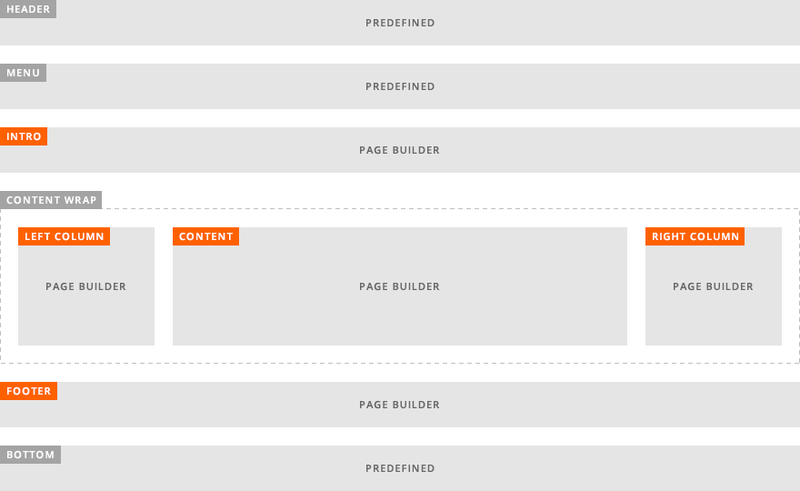 Content blocks stand for styled boxes that are placed within the site’s grid. They are like an extended version of the OpenCart modules enriched with advanced styling and position options. Each block can have unique settings depending on its type. Theme Blocks – custom blocks that come packed with the Page Builder. Some of them are similar to default OpenCart modules (featured products, latest products, bestsellers, specials) but with far more features and customization options. Module blocks – these are are actually OpenCart modules that can be used in the Page Builder just like the theme blocks. In order to use default or third party OpenCart module in Pavilion page builder, you need first to import it. System blocks – system blocks are parts of default OpenCart functionality and depend on the page type.